The Costa Mesa Municipal Budget is a beast that just won't go away this year. For months - actually, the best part of the past dozen months - the city staff, guided by City Manager Allan Roeder, Finance Director Marc Puckett and his strong right-hand man, Budget and Research Officer Bobby Young - have worked diligently to find ways to trim expenditures in light of declining revenues. Unlike most years in the recent past, this year the budget is a real work in progress. The staff presented the City Council with a balanced budget which was then pounded with a meat cleaver by Gary Monahan, resulting in unnecessary significant reductions in youth recreation programs. Some of those were restored in a subsequent council meeting thanks to the efforts of Katrina Foley and Wendy Leece. The major elements of balancing this budget - the cooperation by the employee unions and the assumed, but not confirmed, participation in an enhanced early retirement plan that probably won't come to fruition until the last quarter of this calendar year - are still pending. 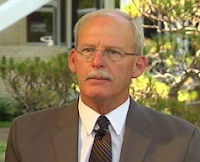 Foley recently announced that she thinks the city and the unions are very close to agreements.... we'll see. There has been much confusion about the budget this year - probably because more people are aware of it, but have not taken the time to educate themselves about it. Believe me, I understand the problem. However, residents may now take advantage of an excellent presentation by Roeder on Channel 24 and streaming video on the internet with his half-hour conversation with moderator Dane Bora. They recently sat in front of the City Hall and talked about many of the elements of this year's budget in terms that are easy to comprehend. Here is the Channel 24 replay schedule for the City Talk segment - unfortunately numbered 666 for those of us with a Biblical orientation. I strongly believe that the residents of this city will get a much clearer picture of our current budget dilemma, and Roeder's perception of how we deal with it, by investing thirty minutes of their time to watch this show. As you can see, it's available every day of this month except the 22nd right through and including August 1st. I wouldn't be surprised if they extend it into the August schedule further. As I said earlier, this is also available for viewing via streaming video on the city web site. I have a link to it over to the right of this page. Additionally, the entire budget proposal is also available for download on the city web site. Puckett, Young and the staff do an excellent job of presenting this information - their efforts have resulted in an entire bookcase full of plaques and trophies for excellence in budget presentation. Take some time, watch this presentation and voice your opinion to your elected leaders. This game is far, far from over. 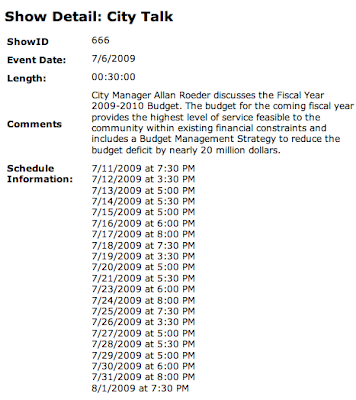 Interesting how the City Budget Show has an id# of 666! What does that tell you!